Having a vegetarian or vegan friend over for a BBQ, or want to cut back on meat yourself? Try these tasty meatless options to cook up on your grill. Some choose vegetarian or vegan lifestyles for health reasons, others for ethical or environmental. Even more people are just trying to cut out meat a couple meals a week to save some money. No matter the reason, if you’re wanting to eat less (or no) meat that doesn’t mean you can’t use your grill this summer. With a little skill and creativity you can create a vegetarian gourmet-style meal on your grill even the most reluctant meat eaters will love. One of the most popular dishes in America, pizza is always a crowd pleaser and easily made vegetarian or vegan and is even more delicious when made on a grill. If you’re feeling particularly chef-y you can make the dough yourself, or you can buy premade dough from your local grocery store. Feel free to use a pizza stone if you have one (make sure to preheat it with the grill), or cook the dough directly on the grill grates to get those fantastic charred grill marks. Peruse your local farmer’s market or backyard garden for toppings, or try this Grilled Veggie Pizza for some inspiration. While many meat eaters may turn up their nose at the thought of tofu, with the right technique and flavors you can satisfy even the pickiest of carnivores. The secret to tofu is its sponge-like quality in soaking up all the flavors of a marinade. You’ll want to make sure to pick a “firm” or “extra firm” variety for grilling purposes, and good, strong flavor profile for the marinade. Grab inspiration from southeast Asia with a sweet and spicy combination, or have a rich, umami and savory mixture. Try this Grilled Marinated Tofu, or grill up your own favorite tofu recipe. Similar to pizza, quesadillas are versatile and arguably underrated. Also like pizza you can find filling inspiration from your own patio or backyard garden or local farmer’s market, and it’s easy to add a touch of sophistication to a lowly dish with some impressive grill marks. Prepare your fillings ahead of time, then throw everything on the grill shortly before your guests arrive to start the dinner party off on the best foot possibly with tasty and unexpected appetizers as soon as they get there. Use dairy-free cheese to make the quesadillas vegan-friendly, and use corn tortillas if any of your guests have a gluten sensitivity. This Grilled Vegetable Quesadilla recipe can show you how it’s done. Grilling doesn’t always have to mean a slab of meat on an open flame, and it also doesn’t have to mean a savory dish. Keep your dinner guests impressed with a delicious grilled dessert like Grilled Peaches with Vanilla Whipped Cream. 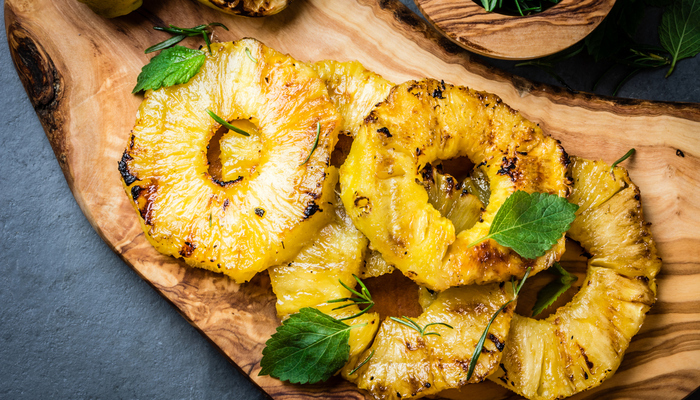 A couple tips when grilling fruit: keep the cuts larger so it’s easier to handle the pieces and so they don’t fall through the grill grates, and firmer fruits like watermelon, apples, peaches, and pineapple work best. If you want something more simple the natural sugars in the fruit will caramelize just fine on their own without any added flavors. You may not think of meatballs when it comes to grilling, especially when you’re grilling for vegetarians. While it may take a bit more kitchen know-how to create a meatless meatball, any recipe that boasts a denser mix should be able to stand up to cooking over an open flame. If you don’t have a favorite vegetarian meatball recipe, try this Grilled Vegan “Meatballs” one to start off. The grill will add a smokiness and umami-filled crust that anyone’s, vegetarian or not, mouth water.